Billions of plastic particles are accumulating in the tissues of sea creatures every six hours, according to new research. The potentially toxic slivers from rubbish dumped in the oceans then end up on our plates in the fish we eat. It takes only a few hours for billions of them to become distributed throughout the major organs of a marine organism. The groundbreaking discovery by British scientists suggests the threat of plastic pollution to human health could be worse than feared. The risk to people is still not known but there are concerns that microplastics can accumulate toxic chemicals and that the tiniest could enter the bloodstream. Austrian scientists recently found that in a study of human stool samples from volunteers around the world – the first of its kind – every one had hundreds of pieces of plastic in them. The British study revealed today was based on the king scallop one of the most popular seafood delicacies in the UK. After six hours exposure in the laboratory, billions of particles measuring 250nm (nanometres) – around 0.00025mm (millimetres) – had ‘stockpiled’ mainly in the intestine. However, considerably more even smaller particles measuring 20nm (0.00002mm) had become dispersed throughout the body – including the kidney, gill, muscle and other organs. And there were still traces of the plastics weeks later – even after the shellfish were moved to unpolluted tanks. Study leader Dr Maya Al Sid Cheikh, of Plymouth University, said: “For this experiment,we needed to develop an entirely novel scientific approach. 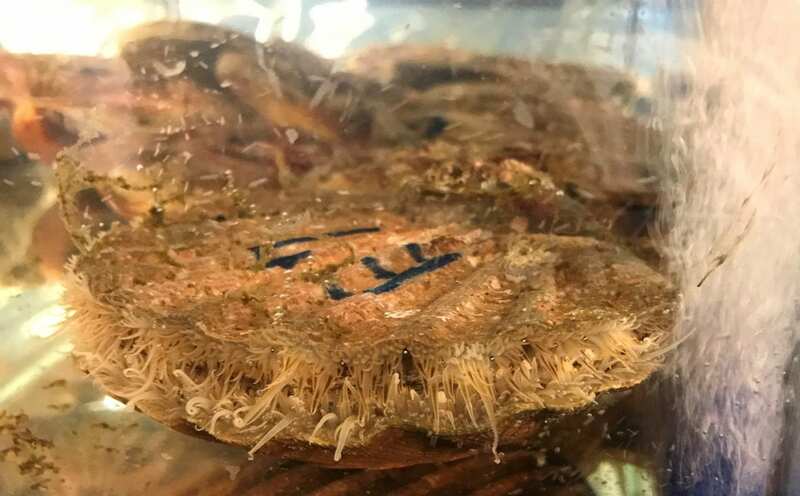 “We made nanoparticles of plastic in our laboratories and incorporated a label so we could trace the particles in the body of the scallop at environmentally relevant concentrations. The king scallop (Pecten maximus) is abundant off UK coasts. With catches worth more than 20 million pounds a year it’s British fishermen’s most valuable wild capture species. It’s the first study to quantify the consumption of nanoparticles by marine animals at predicted environmentally relevant conditions. Previous research has been conducted at far higher concentrations than scientists believe are found in our oceans – making it less reliable. Professor Richard Thompson, head of the university’s International Marine Litter Research Unit, explained: “This is a groundbreaking study in terms of both the scientific approach and the findings. “We only exposed the scallops to nanoparticles for a few hours and – despite them being transferred to clean conditions – traces were still present several weeks later. “Understanding the dynamics of nanoparticle uptake and release, as well as their distribution in body tissues, is essential if we are to understand any potential effects on organisms. In the study published in Environmental Science and Technology the scallops were exposed to plastic beads called carbon-radiolabeled nanopolystyrene. These are similar to those used in cosmetics and other common household products. After six hours a scanning technique known as autoradiography showed the number of particles present in their organs and tissue. The international team – including colleagues in Scotland and Canada – then demonstrated the 20nm particles were no longer detectable after 14 days. But the larger 250nm particles took 48 days to disappear. Prof Ted Henry, an environmental toxicologist at Heriot-Watt University in Edinburgh, said: “ Understanding whether plastic particles are absorbed across biological membranes and accumulate within internal organs is critical for assessing the risk these particles pose to both organism and human health. The study was carried out as part of RealRiskNano – a £1.1million project funded by the Natural Environment Research Council (NERC). Led by Heriot-Watt and Plymouth, it is exploring the effects which microscopic plastic particles can have on the marine environment. Earlier this year Manchester University researchers revealed the highest microplastic pollution yet discovered anywhere in the world in the River Tame in Lancashire. The major floods in the area in 2015-16 flushed more than 40bn particles into the sea. The surge of such a vast amount from one small river catchment in a single event led the scientists to conclude the current estimate for the number in the ocean – five trillion – is a major underestimate.